The National Stationery Show is now only 6 days away! We are excited to see the post cards begin to gather in New York from all over the world. Don't miss out in collecting a set of post cards at the Show beginning May 17th - May 20th. Stop by any of the participating booths to begin the scavenger hunt with a guide. Stay tuned as we post more information on the blog, facebook and twitter. Greetings from: Farewell Paperie from Seattle using Colorplan, Bruno Press from Minnesota using Lanaquarelle, Maginating from San Diego using Sirio Ultra Black, Gilah Press from Baltimore using Rives BFK Tan. Last Day to Collect your Alphabet Cards! Do you know your ABC's for the 2014 Stationery Show? Wondering what the next Stationery Show promotional project will be? Hope you know your ABC's for our FOURTH annual Stationery Show project! Organized by Flywheel Press and sponsored by Legion, we are all super excited to watch this year’s project grow to become our best yet! As 27 different fine art papers were sent out, 26 Alphabet cards are beginning to fly in from amazing designers (who are allNSS exhibitors). As done in the past, attendees of NSS will participate in a scavenger hunt to collect all 26 letters. 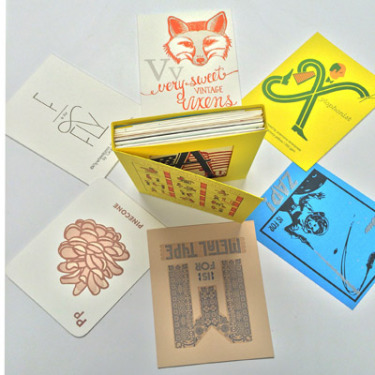 Once you have A through Z, stop by Legion's booth (3330) to stack your cards in packaging created by Lady Pilot Letterpress. 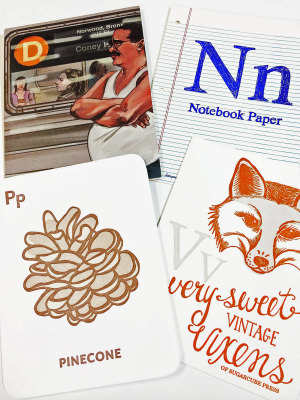 The National Stationery Show is just around the corner (May 18th) and we are ready to blow you away with our ABC’s. To the left is a sneak preview to some of the many cards we are recieving for the 2014 Stationery Show by Albertine Press, A Favorite Design, The Nic Studio and Sugarcube Press. Stayed posted to our Facebook, Twitter and Blog for more info on our Alphabet cards! Designer list with their booth numbers will be coming soon! Legion recieved an inquiry from a potential eager zero-profit corp looking for their perfect paper. The purpose is all profit going to programs that support the arts, specifically those that teach art as a healing component, and to redirect troubled youth. They plan to create earning opportunties for those with barriers to employment (e.g. disabilities, seniors). What were they looking for? A paper that has some tooth to it (e.g.stonehenge or artagain paper, both being perfect for colored pencils), but is sized externally and internally to handle ink, moderate watercolor washes and markers. Essentially, an all media paper that is the same on both sides, in a compact 90# weight or so, perfect for sketchbooks. Our answer: You mentioned Stonehenge, which is a paper I created in 1971 for a bunch of various applications; primarily printmaking & serigraphy back then, but now the grade has become a real “go to” paper for all mediums, especially colored pencil. You mentioned 90# - I am assuming you mean cover weight not text or book weight. You also mention you want a paper that has texture and is the same on both sides: Stonehenge is relatively smooth and has very little texture or roughness – I did this deliberately when I produced it because the market wanted a semi-smooth (not hot press) surface. With regards to the surface being the same on both sides, you will not be able to achieve that with a machine-made paper, i.e. Stonehenge, Lenox, Coventry Rag by virtue of manufacturing – machine-made papers will always give you a two-sidedness. Ask an expert for your perfect paper. We came across a short, helpful article on this topic from Jerzy at Nitram Charcoal. Worth a quick read for anyone interested in charcoal drawing.